Toulouse is frequently cited as the best place to live in France and often tops the surveys as the place that French people would most like to live. With a population of 358,500, Toulouse is France’s fourth largest city (after Paris, Lyon and Marseille) and is the capital of the Midi-Pyrenees. The city has achieved a steady economic rise since World War II and is now home to many different industries, including its advanced aerospace facilities that aided the creation of the Concorde. It is also full of beautiful buildings, excellent restaurants, theatres, cinemas, museums, art galleries and has a strong Spanish vibe. The University of Toulouse is the biggest Institute of Higher Education outside of Paris and the large student population adds to the lively atmosphere of the city. Commonly known as ‘la ville rose’ or ‘the pink city’ due to the predominant colour of its bricks – constructed from local clay, the historic town centre is a wonderful place to walk with is maze of streets, quirky buildings and impressive architecture. The famous basilique St-Sernin is the largest Romanesque basilica in the Western world and houses the remains of St Sernin, martyred in year 250. Also of interest are the pink-brick quarters of Capitole, the cathédrale St-Étienne, and the medieval Jacobins monastery known for its international piano festival. 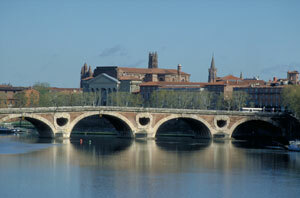 Toulouse was an important stage on the pilgrimage to Santiago de Compostela. 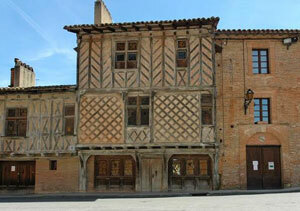 Toulouse and the regions around are also well known for their gastronomic delights. 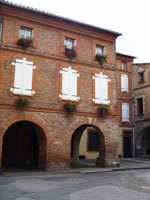 Montesquieu Volvestre is a lively bastide (walled) town situated on an historically important crossroads between Toulouse, Foix, St Gaudens and St Girons. Built on a loop of the Arize River in the 13th century by Count Raymond of Toulouse, the town was designed as a typical bastide, with a fortified church and city walls surrounding a central square and streets laid out in a carefully defined grid pattern. Worth a look is the fortified Church of St Victor with its distinctive tower. Also interesting are the “moulins”, or windmills, and the Château de Palays, a 14th century privately owned chateau classified as an historic monument. The town has excellent amenities, with shops, schools and sporting facilities as well as a traditional street market held every Saturday morning with all the best fresh local produce and specialities. Prettily situated on a bend of the river Arize, Rieux is an ancient bishopric, dating from the middle ages, which still retains its ancient beauty. The half-timbered, medieval houses, the lovely bridges and the stunning Cathedral are all worth a look. The Cathedral’s Toulouse-style octagonal bell tower is one of the loveliest in the Midi. Around the town there are more than 40 kilometres of walking paths and sailing at the Garonne lake and horse riding at the Volvestre Centre d’Equitation. 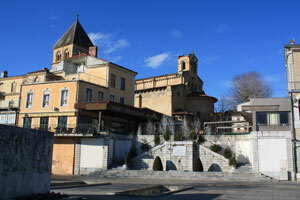 A favourite haunt of the Romans, the sunny and windless microclimate of this small spa town reinforces the beneficial effects of its heavily salted thermal spring water and provides the town with its motto In sale salus (health through salt). The town’s slightly faded but very elegant architecture has gradually been restored over recent years and there are numerous shops, a primary and secondary school, tennis and sporting facilities as well as a casino. There is a lively local market here on a Monday. In this medieval village nestling at the foot of a magnificent fortified chateau, the remains have been discovered of the people who lived here nearly 300 centuries ago. The shaped flints and bones found here in 1860 gave the name to the Aurignacian period of Palaeolithic culture. 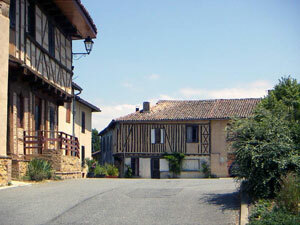 All around the town are the remains of the 13th Century town, including fortifications, the city gate, church and chateau. It is possible to climb to the top of the round castle keep for fabulous views of the Pyrenees. Aurignac is a vibrant market town with a thriving community and plenty of shops and facilities including a primary school, doctors and library. 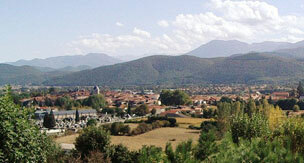 Traditionally, St Gaudens was the capital city of the Haute-Garonne department. This is, of course, no longer the case, as the much larger Toulouse has sprung to prominence and laid claim to that title. However, St Gaudens remains important in a variety of ways. A pretty town, large enough to offer all amenities, St Gaudens lies in beautiful countryside in the Garonne River valley, facing the Pyrenean Mountains which gives it a truly spectacular setting. On a clear day you can see the peaks, snow clad in winter, soaring into the sky above you, and many properties in the town benefit from this view. St Gaudens is an ancient, fortified town and evidence of life stretching over 30,000 years has been found here, including the oldest Gallo-Roman villa that has ever been discovered. Built in the 11th century, St Gaudens was extended in the 14th century and the fortifications were modified when the internal walls were demolished in the 16th century. Walking around the town you will see a plethora of ancient little chapels and solid fortresses which have managed to withstand the changing conditions (both climatic and political) of Haute-Garonne over many centuries. St Gaudens has many lovely old cobbled streets and fascinating corners to explore. It also has a useful modern side to it, and as a sizeable town it can offer pretty much everything you may need for a comfortable modern existence. There are a number of shops and large supermarkets, doctors, dentists, schools and banks. The town is well placed for sports enthusiasts, as it offers easy access to the mountains and all the wonderful sporting opportunities found there. Boulogne sur Gesse dates back to the 13th century when it was founded by Cistercian Monks from Nizors Abbey. It is dominated by the 14th century Notre Dame Church of the Assumption with its beautiful frescos and murals, pulpit and bell-tower. The most prominent feature is however the viaduct with its eight arches, on which the Toulouse-Boulogne railway line was built. No longer in operation (last used in 1949) you can now hike along parts of the viaduct. Boulogne is quite a busy market town though small in size, with a population of just 1500. There are several rural villages and hamlets close by, all set amidst rolling countryside with lovely views of the Pyrenées. A bustling weekly market is held in the centre, and there is a good selection of shops and services available. 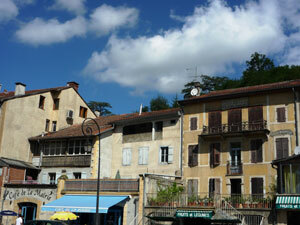 Nearby Lake Boulogne offers an area in which to relax and take in the stunning surroundings. Here there is a picnic area, playground and swimming pool. 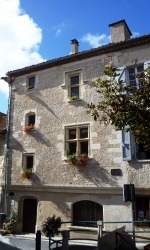 Montréjeau is a lovely bastide town, built in the 13th century to withstand attack from the English. 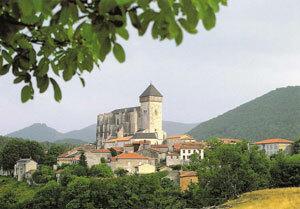 It has a typical arcaded central squares and streets following a grid pattern with a lovely fortified church. The town is busy and thriving today, with a great atmosphere and friendly inhabitants and all modern amenities, with good shops, banks and schools. There is also a good selection of bars, cafés and restaurants and Montréjeau is also known for its great festivals held throughout the summer. Sports facilities include a golf course; Golf de Comminges in Montréjeau, beside the Garonne River. Scenic and friendly, it’s a great place to spend time getting a little gentle exercise and improving your handicap into the bargain. For those so inclined, hang gliding, fishing and rock climbing are all on offer in the area and the town lies only a very short drive from the ski resorts for summer and winter sports. This major historical site, perched on top of a promontory is known as the “Petit Mont Saint Michel” of the Pyrenees. The town was originally founded by the Romans, known as Lugdunum and was an important colony of over 100,000 inhabitants prior to being ravaged by the Barbarians in the 6th century. In the 11th century, Bertrand de Lisle-Jourdain was named bishop of Comminges and had a cathedral built in the Roman style. Next to the cathedral there is a magnificent cloister and at the foot of the hill a large part of the Roman town (1st Century AD) has been unearthed which clearly show the former hot baths, the temple, the theatre, the market place and the basilica. The town is in a lovely location, surrounded by the lush, green valleys of the region with a backdrop of the stunning Pyrenees Mountains. The architecture is interesting with lots of traditional wooden barns and impressive carpentry. The inhabitants of St Bertrand now number 250 although there are many more in the pretty surrounding hamlets. Bagnères de Luchon is an ancient, elegant spa town and ski resort with grand houses and hotels testifying to its illustrious past when the who’s who of Europe descended to take the waters including Flaubert, Bismarck and Mata Hari. The spa was built in 1848 on the site of the old Roman baths. Today the waters are reputed to help rheumatism and ear, nose and throat problems. 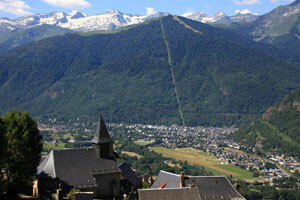 In spring, summer and autumn health seekers and holiday makers come to Luchon for the waters and mountains. In the winter it is the turn of the skiers and winter sports fans. 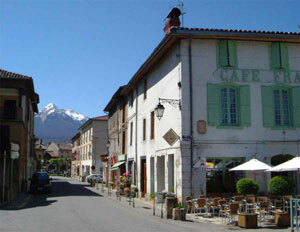 Known as “the Queen of the Pyrenees”, the centre of Luchon is a little slice of Paris. The busy, tree-lined, boulevard Allées d’Etigny, has rows of restaurants and street cafes, boulangèries and chocolateries with the accompanying enticing aromas of coffee, wine and food. The town is full of flowers, fountains and gardens and well equipped with shops; and you can buy pretty much anything you need in the town itself. Luchon also produces 30 million bottles per year of its own mineral water which has been classified since 1990 and is said to be particularly therapeutic and refreshing. Luchon offers you the chance to enjoy a great days skiing at its ski station of Superbagnères, (accessed by cable car from the town centre or by car) followed by the ultimate indulgence of a relaxing spa treatment to ease those tired muscles. Other sports available in the area include paragliding, walking, golf, pony trekking and fishing. All surrounded by some of France’s prettiest scenery and soaring snowy peaks making one of the most dramatic backdrops you could hope to find. Plus, of course, Spain is only 10 km down the road. A very popular and vibrant, small market town in a great location. Just fifty minutes from Toulouse, close to St Gaudens and with easy access to mountains and skiing, this is a very ‘French’ town with a lovely central square, quintessential cafés, market place and a variety of shops, primary school, swimming pool and tennis club. Aspet has a thriving, friendly community, pretty houses and lovely surrounding countryside. Please read the notable towns in the Ariege guide.